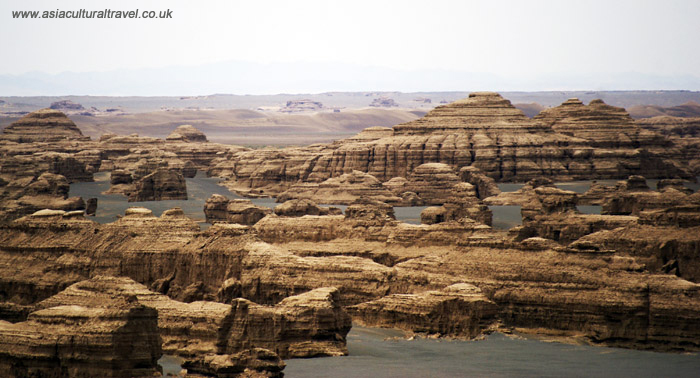 While he was travelling through the treacherous Lop Nur region of Western China, Swedish explorer Sven Hedin (1865-1952) came upon a group of strange rock formations just outside of Dunhuang. He named them “yardangs”, a term that is still in use today. Yet you’d be right to think that the word “yardang” doesn’t sound particularly Swedish! It was derived from the Chinese name “Yǎ Dān Dìmào” (雅丹地貌), which literally means “small solid hills with a sharp cliff”. Yardangs are the result of severe weathering, where wind and rain have stripped all of the soft material from the rocks and left only the hard material behind. Over a period of approximately 700,000 years, this erosion produced the wonderfully bizarre rock formations that we find today. They have characteristically wide bottoms that gradually taper off towards the top, giving them an appearance similar to the hull of a boat, although there are huge variations in their size and shape. China owns the largest distribution of yardangs in the world and, of these, Dunhuang Yardang National Geopark contains the lion’s share. Exhibiting over 300 square kilometres (116 sq. mi) of yardangs, it covers an area over 100 times the size of the city of London! It’s rumoured that, if you use your imagination, some of these them begin to look like famous world sites, such as the Leaning Tower of Pisa and the Pyramids of Egypt. That being said, to you they may all just look like rocks! From the Han Dynasty (206 BC–220 AD) onwards, one of the ancient Silk Road’s southern branches passed through this eerie alien landscape. Trading caravans would frequently get lost for several days amongst the yardangs, as they were notoriously difficult to navigate, and the monstrous shapes of the rocks, coupled with the ghostly sound of the wind whipping through the narrow passes, resulted in the area being nicknamed the “Town of Demons”. From the “Camel” and the “Stone Bird” to the “Peacock” and the “Golden Lion Welcoming His Guests”, this geopark is haunted by a myriad of stone animals. 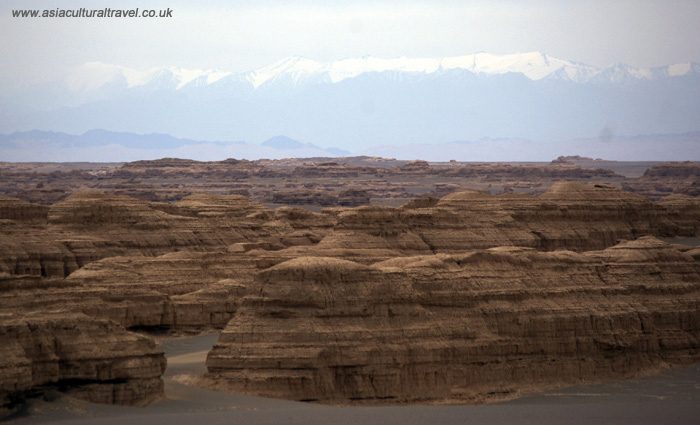 Located just 185 kilometres (115 mi) from Dunhuang and about 85 kilometres (53 mi) west of the legendary Yumen Pass, the Dunhuang Yardang National Geopark is a must-see attraction for those eager to explore the weirder side of the Gobi Desert and the Silk Road. Surrounded by the unnerving silence of the desert and faced with the alien shapes of the yardangs, it’s no wonder people have become fascinated with this spooky place.